Have you ever mourned a pet? 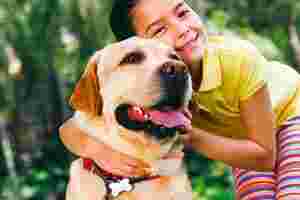 Mixed blessing: Getting a pet will teach your children compassion. The night before my dog, Inji, died, she and I lay beside each other on the orange couch in our living room. She didn’t shut her dilated golden eyes the whole night and neither did I. Too weak to move after a month of not eating, my beautiful beige Labrador with her still-silky coat suffered spasms all through the night as I kept watch. The E. coli infection that had eaten through her kidneys had finally lodged inside her brain. The shivering that had started six weeks earlier turned into violent paroxysms. Let go, child, I whispered, as she drooled bile and saliva; as her body rattled so hard I could hear the emptiness inside. I wanted her to die; I wanted the decision not to be mine. Her eyes never left me, even as I went to get her some water from the kitchen—water that spilled off the sides of her mouth. Was she scared? I don’t know. I was. You want to know about grief. Let me tell you about grief—not the spousal grief so beautifully captured by Joan Didion in her book, The Year of Magical Thinking. This grief is the kind that is felt by a whole family that watches a beloved pet lose life’s last battle. Grief is the sound of drips, the coldness of a metal stretcher, and the smell of antiseptic mixed with urine. It is about monitoring intravenous fluids and a cocktail of drugs. Grief isn’t one emotion. It is shock, rage, bitterness and incessant questions. Why me? What’s a good way to die? The entire span of her illness was six weeks. Was that too short a time; or too long a time to watch her suffer? Was it good that her illness gave our family time to adjust? Or would it have been better if she had suffered a stroke and died the next day without suffering? I can tell you that there were days during that long month when I woke up in the morning, dreading the sight of her tired, prone body and feebly wagging tail. Although I am ashamed to admit it now, I occasionally wished that Inji would die in her sleep, relieving me of decisions about drugs that didn’t seem to work; freeing me from days and nights at the clinic. After several weeks of this bleak routine, I just wanted the whole thing to be over. Not my husband. People react in different ways to health crises. You learn new things about your spouse and children. I learnt that my husband, who didn’t even like Inji as much as I did, would never give up on her. He was like a maniac—going on the Internet to discover new medication; consulting four vets (one in the US) about urine cultures and blood reports. We argued over medical protocols and rising creatinine count. I wanted to let Inji finish her life at home, without needles, in peace. He accused me of pulling the plug; copping out. He never gave up. Till one day he did and the next day, our dog died. He is still grieving. I seem to be over it; or so I tell myself during those moments when I feel Inji behind me as I boil milk in the kitchen. I say this when I insert the key into my front door and feel my body tighten with pleasure in anticipation of the overjoyed welcome my dog gave me—tail wagging, body shaking from side to side. I still smile when I open the door. And then I stop. That last evening, Inji started frothing at the mouth. She had stopped drinking. It was over, said the vet. The infection had affected her brain. That evening, we returned home from the clinic and followed the usual routine of calling four vets before deciding that the illness had won. My husband conceded defeat and called my sister-in-law, Priya. Every family has a go-to person for various crises. You call your Mom for certain things; your Dad for others; your siblings for something. Priya loves all animals; and babies. She was the first person we called that evening. She and my brother came over; and didn’t leave till we buried Inji. Who are you? Are you the kind that grieves intensely and quickly; or does your grief take time to reveal itself and leave? Does it ever leave? In the days that followed Inji’s death, I told myself and everyone else that I was over it. As I watched the palpable grief in the people I love, I told myself that I was different; somehow stronger. Not true. Dr Morton came over on Inji’s last morning. We asked if Inji had a chance to recover. He said “No". He said: “If I don’t anaesthetize her now, she’ll be dead by tonight. But she’ll be in pain the whole day." We debated whether to pull the children out of school, and ended up bringing my elder daughter back but leaving the younger one out of the whole thing. At 11.30, my elder daughter put Inji’s head on her lap. My mother poured Ganga jal into her mouth. Inji sipped it. My father looked dazed. Everyone wept. Our friend, Sriram—a dog lover who simply showed up as friends do in times of crisis—said: “Watch her eyes. It helps you gain some closure." So I stared into my dog’s eyes, watching for signs of pain or hurt. Her eyes remained dilated. Death would occur in a few seconds, said the doctor. I saw the light go out of Inji’s eyes. With my fingers, I closed them. We drove in a motorcade to Kengeri, an hour outside Bangalore, where a wonderful organization called People for Animals (www.peopleforanimalsbangalore.org) rescues wildlife and rehabilitates it. They also have a pet cemetery in a woody knoll. We buried Inji there with full honours and rites: four pall-bearers, sprinkled rice, her favourite foods—milk, bananas—and a jasmine garland. To those of you who are considering getting a pet, let me tell you my experience. Having a dog in the house forced my husband and I to walk together twice a day. It was the best 20 minutes of our relationship. Sans interruptions, we enjoyed the morning sunshine, the relative quiet, and talked about news and world affairs; about trees and philosophy. We met other dog owners and learnt the rhythms of our street. Having a dog had an impact on our children but not always in pleasant, predictable ways. There were many days when I said nasty, awful things to them in an attempt to goad them to do more doggy chores. “We should have never got this bloody dog," I would scream as they watched MasterChef Australia, when they ought to have been walking Inji. Having a pet is a lot of work. The benefits are hard to measure. Children curled into a ball with Inji; feeling good every morning because the silly dog wags its tail so hard—how to measure this? If you are considering a pet “for the children’s sake", realize that it will not be idyllic. But it will teach your children compassion. Your child will suddenly notice other animals, birds, stray dogs, insects and trees and view them as an extension of your family. Your child might refuse to burst Diwali crackers because she is worried that the rockets flying to the sky will scare the birds. We want to get another dog, but not from a breeder. Rather, from shelters such as CUPA or Compassion Unlimited Plus Action. At the clinic, I watched French expats bring in beautiful crossbreeds with limpid eyes. Most were strays that had been transformed by love into sleek pets. Every Indian city has organizations that place orphaned animals into loving homes. The Hindu carries photographs of puppies that need placement every week. If you are considering a pet, please consider adopting a robust stray—mongrels are healthier. If you define a well-lived life as having a variety of experiences, then get a pet. I have stared at death in my dog’s face and it isn’t pretty. It haunts me to this day. But it has also prepared me for other kinds of death. I have also experienced the kind of love that even my mother or children cannot give me. People who want to experience unconditional love should get a dog; but also be prepared to take it out to pee four times a day. It’s been six months. I miss Inji every day.